Our take away service is available all day - perfect if you are on the go, eating in the office or need a little pick me up as you explore London. Freshly made soups, salads, sandwiches and more are on offer throughout the day, with our baristas serving coffees, teas and hot chocolate. From breakfast and lunch to pre-theatre or, indeed, any time in between. With no reservations necessary, enjoy table service both inside or alfresco, with our extensive range of freshly made viennoiserie, sandwiches, soups, salads, konditorei and more. As the light fades in Aldwych, our candles are lit, the wine is poured, and the Mittel-European café tradition lives on. Stop by for a pre-theatre bite or simply enjoy our selection of wines, beers and cocktails with evening snacks such as rosti, cheese fondu, croquettes, frikadellen and currywurst. Handmade by our experienced pastry team, led by Head Pastry Chef, Regis Negrier, celebration cakes and pastries are our speciality. Throughout the year, our team create a delectable range of sweet treats and seasonal gifts, available to purchase at The Delaunay Counter. We can also create personalised cakes, tarts and pastries for any celebration - please see our menu here. If you would like to place an order, please email cakes@thecounter.co.uk, giving us at least 48 hours' notice. 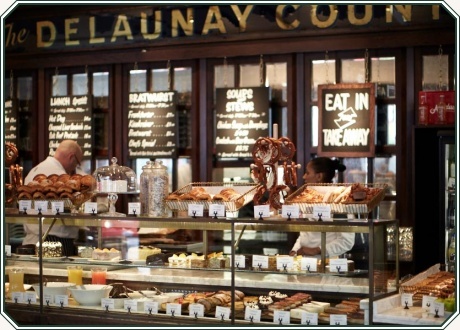 The Delaunay Counter provides a unique and atmospheric setting for any special event. We can accommodate up to 32 seated guests on four round tables of eight, and up to 60 standing guests for drinks and canapé receptions. Our private events team would be delighted to tailor any event to your specific requirements. For further information, please email info@thecounter.co.uk or call our Private Events team on 020 7659 9316 during office hours. From kitchen to counter… Our special-edition Easter chocolates. 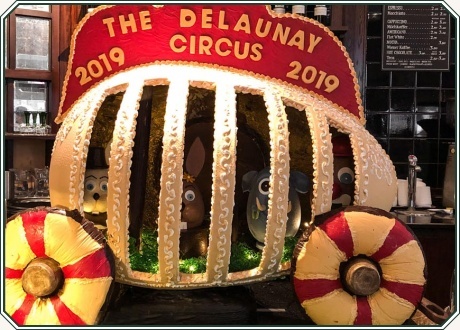 In acknowledgement of the tradition of enjoying sweet treats at Easter, Head Pastry Chef Regis and his team have this year created a remarkable selection of 'Circus' themed confectionary. Displayed within an eye-catching chocolate egg, stop by The Delaunay Counter this April for an array of the individually handmade chocolate creations. From Magician and Ringmaster Chocolate Bunnies, Chocolate Lions, Elephants and Clowns to the more traditional Chocolate Eggs, Easter Lambs and Hot Cross Buns, there is something for everyone. Available to purchase from The Delaunay Counter with prices starting at £7.85 (and from £1.45 for the Hot Cross Buns).